The D3400 has an excellent autofocus system, brilliant battery life and superb image quality, but it’s also easy enough for complete beginners. Nikon’s entry level DSLRs focus – pun intended – on the important things: light weight, small bodies, simple design and excellent results, alongside the many benefits of interchangeable lenses. This is an update to the excellent D3300 with lighter weight, better battery life and a redesigned kit lens. 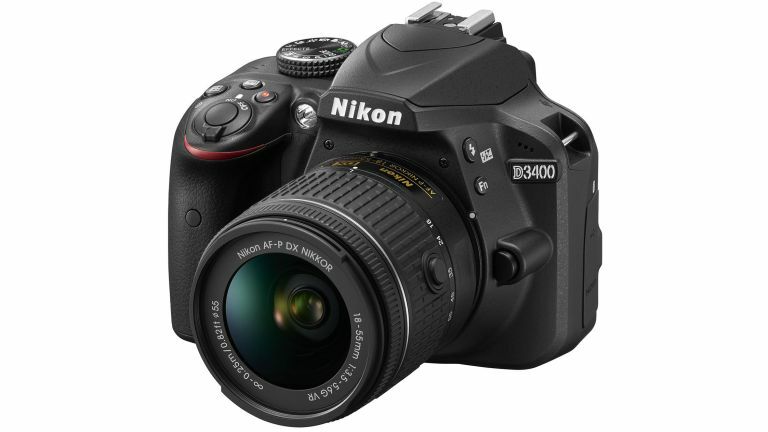 This is one of the lightest DSLRs you can buy: it’s about 40g less than a Canon EOS 1300D with an 18-55mm lens. Ready to go with the kit lens on it comes in at a respectably low 650g, which you’ll appreciate during long shooting sessions. The light weight and small size isn’t at the expense of practicality, though. Grip is good and you needn’t fear accidentally moving or hitting any controls. There is one trade-off here, and that’s balance. Stick even a slightly bigger lens on the D3400 and it becomes quite significantly unbalanced. The grip uses soft rubber, the buttons are reasonably sized and the mode selector is easy to use. Overall tactility isn’t as good as the five-series Nikons, but then they’re an awful lot more expensive. The 11-point autofocus is very quiet and much the same as in previous models in terms of performance: it’s a little slower in poor lighting conditions, although there’s an AF Assist light to help in those circumstances. Nikon’s Picture Control options give you a good range of shooting settings, including the useful Flat option that debuted in the D810. Standard mode is good for everyday shooting: it doesn’t overly saturate the colours or leave them looking washed out. Vivid is fun for florals, and you can mess around with individual settings such as contrast, brightness and saturation. The sensor offers ISO levels from ISO100 to ISO25,600, and as there’s no low-pass filter it can take incredibly detailed images, especially with a macro lens. The supplied kit lens isn’t the best around, though: image quality is lacking at the extremes of wide angle and telephoto shooting. Like similar lenses you’ll note chromatic aberration and some distortion in RAW files, although the software does a good job of sorting them in JPEGs. Like many similar cameras the metering tends towards underexposure but otherwise works very well, and the Auto White Balance is very effective too. It’s not a great action camera – it only shoots bursts up to 5fps and it doesn’t do 4K video either – but for everything else it’s a great all rounder. We like the Bluetooth file transfer (Nikon calls it SnapBridge and requires an app of the same name) but not the app, which was flakey on our iPhone 6. One of our favourite features is the battery life, which is good for 1299 shots: we had all three battery bars two days into our tests. The D3400 was a little pricey at launch, but now its price has fallen it’s a superb starting point for anyone new to DSLRs. It’s easy to use, has excellent image quality and of course it’s compatible with an enormous number of high quality lenses. That long battery life makes it particularly good for outdoor work, travel and festivals.